Is there any quick way to, given an executable file, create a Windows service that, when started, launches it? sc.exe create <new_service_name> binPath= "<path_to_the_service_executable>"
You must have quotation marks around the actual exe path, and a space after the binPath=. More information on the sc command can be found in Microsoft KB251192. There are tools that can create a Windows Service from arbitrary, non-service executables, see the other answers for examples of such tools. Use NSSM( the non-Sucking Service Manager ) to run a .BAT or any .EXE file as a service. Many existing answers include human intervention at install time. This can be an error-prone process. 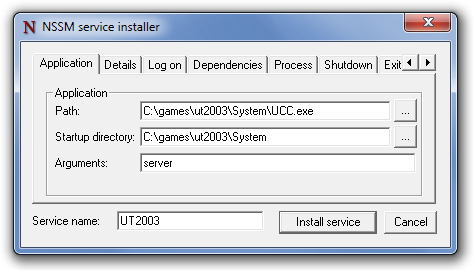 If you have many executables wanted to be installed as services, the last thing you want to do is to do them manually at install time. will install the service. stdout and stderr are all logged. For more info, take a look at the project website. A working configuration file is very simple, as demonstrated below. But it also has many useful features such as <env> and <persistent_env> below. If your service name has any spaces, enclose in "quotes". Not the answer you're looking for? Browse other questions tagged windows windows-services or ask your own question. How to prevent closing java applications? Create and start Windows 7 or 10 service using batch file?